Phase 1 Implementation of the Leach Botanical Garden Master Plan is underway. The first phase of development includes the Aerial Treewalk and Pollinator Garden. Visitors will stroll on an elevated walkway designed by Land Morphology. High in the tree canopy, the treewalk offers an immersive visitor experience. The fireside terrace arbor by Olson Kundig serves as a gathering area and an entry point onto the treewalk. How can the design preserve and bring forward the environmental values that are the founders’ legacy? How can a cohesive garden experience include the introduction of more modern, green, and sustainable technologies and buildings? Can new features successfully integrate with the historic gardens and buildings? A sensitivity to place and to client values is instrumental to answering those questions. John and Lilla Leach were early advocates of environmental stewardship and gifted their estate, including the original Manor House and annex, to the City of Portland in the 1970s. Land Morphology envisioned a master plan that celebrates the past while embracing a bright and innovative future. As a result, the lower garden near Johnson Creek will remain traditional and focus on preserving and restoring environmentally sensitive landscapes and structures. 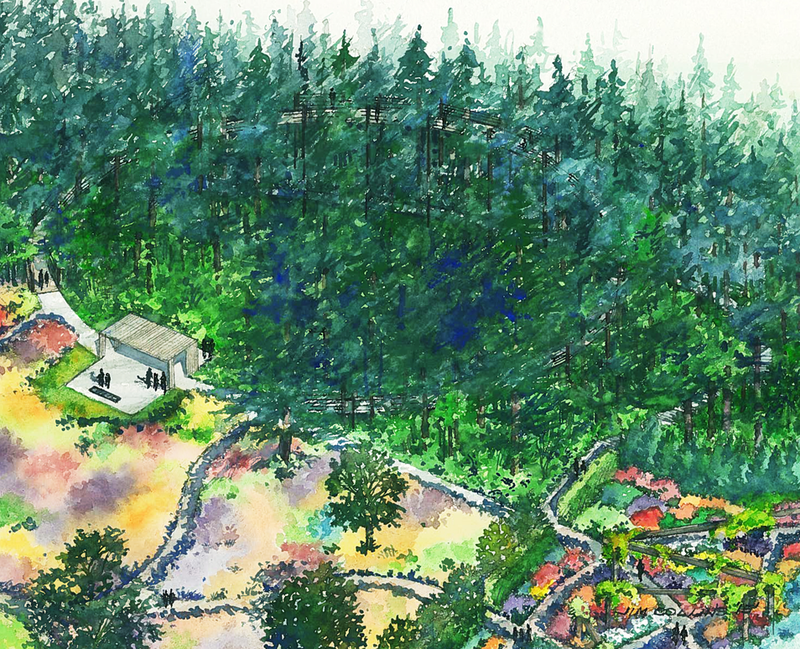 The Hillside, a transition between contemporary upper garden and traditional lower garden, will highlight forest management, restoration, and succession. On the hillside the aerial treewalk will create a new way to experience historic gardens. Currently, plant collections are organized in large, informal displays in an arboretum setting and impressive trees are underplanted with natives. Land Morphology has organized the collections and gardens ecologically along the north/south transect, with cultural references along the east/west transect. The historic garden’s plant collections focus on the Cascadia and Siskiyou Mountains where John and Lilla Leach spent many of their years. The master plan honors and expands existing collections while adding new exotic global collections including meadow, Garry oak savanna, coniferous woodland, gen, and aquatic plants. Embracing the mature trees and rising 30 feet above the forest floor, the aerial treewalk will offer visitors a novel perspective of the forest, creating an iconographic and distinctive experience. As part of the master plan, Olson Kundig-designed buildings planned for the garden sit lightly on the ground and integrate sustainable building technologies. The result is an experience designed to highlight people’s relationship to plants and reveal the intersection of culture and ecology.